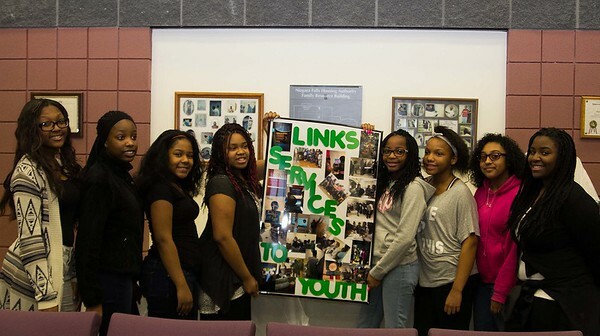 Members of the Gaskill Prep mentoring program SISTA (Sisters Informing Sisters it's Alright to Achieve) hold a sign for Links Services to Youth during the Links Inc. program at the Doris Jones Family Resource Center Sunday afternoon. From left are: Jordan Ford, Ranasiah Williams, Megara Rose, Mahegani Lewis, Aliyah Carver, Sydni Booze, Jasah Jackson, and Keilana Agee. The mentoring program is co-chaired by Kimberley McCarthy and Lee Whitaker, not pictured.